Hello and welcome to my blog! I have been thinking about starting a blog for awhile now, and am excited it’s finally coming to fruition. This blog will take a look at some of my fun, behind-the-scenes experiences and oddball encounters while working in the Thoroughbred industry, and it will also include some of the rescue stories and triumphs in racing that often get lost in the shuffle, but need to be told. 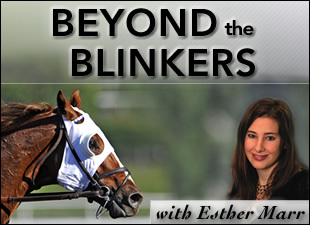 If you have a story you would like to share, please email me—I always love to hear about the “behind the blinkers” horse racing-related tales from around the country and world. After 94 starts mostly on the Illinois circuit, Buster Bailey is living the good life at Robert N. Clay’s Three Chimneys Farm near Midway, Ky. The son of Mister Baileys was galloped as a 2-year-old at Stony Oak Farm near Paris, Ky. by Jen Roytz, who now serves as Three Chimneys’ marketing and communications director. Roytz hadn’t followed Buster Bailey throughout his career, but discovered by chance last year that he was still running at age 11. Roytz explained that while the gelding’s former owner Margaret Lazuka and trainer William Lazuka took good care of Buster Bailey, he had never had a significant break throughout his nine years of racing. The gelding, who campaigned steadily from 2001-2009, finally retired last summer with a record of 6-10-8 and earnings of $152,492. In his lone start in stakes company, Buster Bailey finished third in the 2002 Explosive Darling Handicap at Arlington. After rediscovering Buster Bailey’s whereabouts and deciding to purchase the horse, Roytz took a chance and asked Three Chimneys officials if she could board him at the farm. To her delight, they obliged. Her next challenge was coming up with the money to ship the horse to Kentucky, but a solution came sooner than she thought. As a further testament to the caretaking skills of Buster Bailey’s former owner and trainer, the veterinarian who initially examined the horse upon his arrival (who also didn’t charge, with the same “do right by the horse” mentality) said he had retired sound and in overall good condition, considering his age and the fact he was heavily raced. “He raced without a break, but is now in a lush pasture filled with Kentucky bluegrass,” said Roytz, adding that some of Buster Bailey’s neighbors at Three Chimneys include 2003 Breeders’ Cup Sprint (gr. I) winner Cajun Beat, and the dams of four grade I winners. “Three Chimneys has allowed me to keep Buster here as long as he needs to rest and recuperate from a long career. He is now on a part of our farm for our resident retirees…while his resume sure doesn’t compare to the others he’s with, he will be cared for just as well. Roytz plans on putting Buster Bailey back under tack in the spring, and eventually finding him a forever home. Remember, if you have stories to share, please email me at emarr@bloodhorse.com.